Adorable Whimsical Trees with Nordic Scandinavian Touches Christmas Stocking that can be embroidered free of charge. 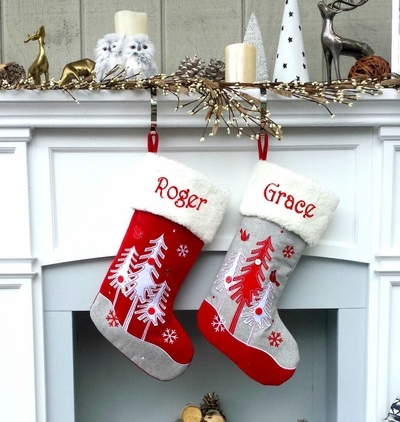 We feature a Red Stocking and Grey Stocking version so you can make a set. Measured along the diagonal from the top left hand corner to the toe, the stocking measures 19.5 inches, and the width along the cuff is 7.5 inches.